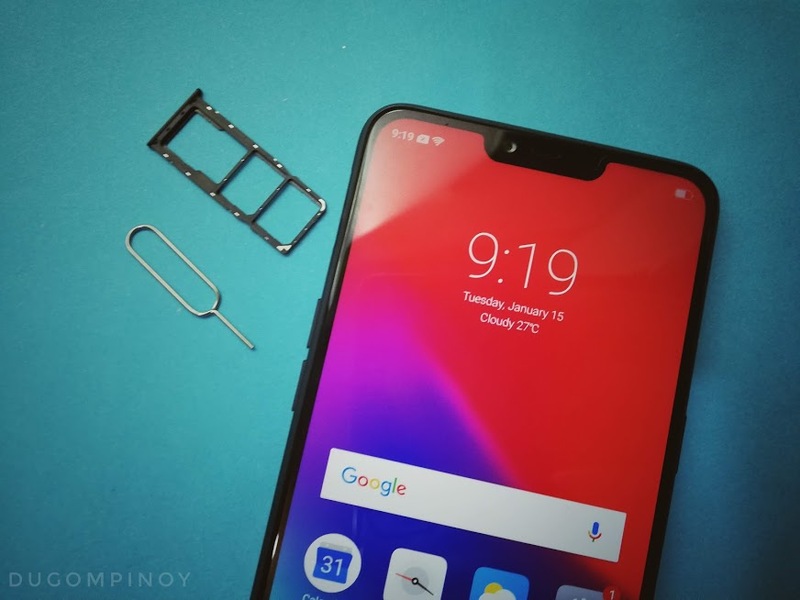 It was only in November of 2018 when Realme, then a sub-brand of OPPO, officially entered the Philippine market with its first outing called the Realme C1. This smartphone is sporting quite impressive specs and design for a price tag only Php5,990. 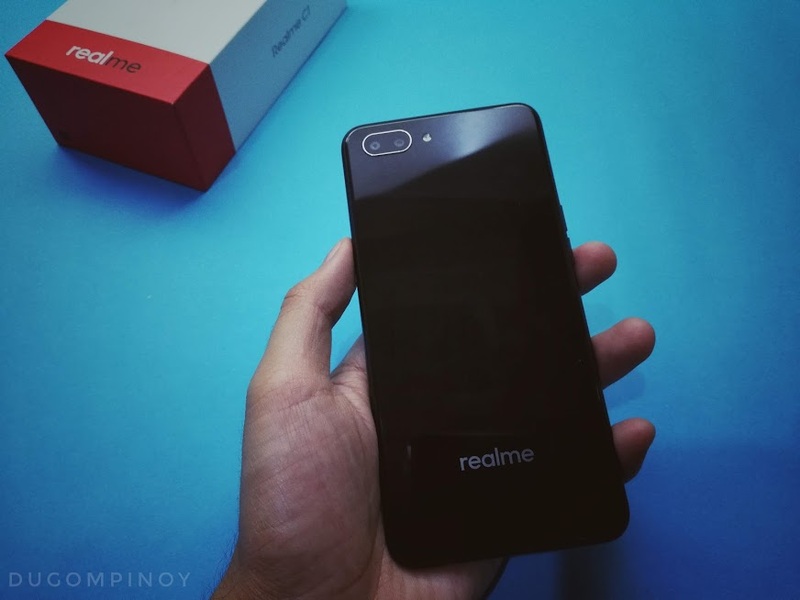 Fast forward to today, Realme is already one of the most well known smartphone brands in the Philippines with almost every smartphone enthusiast already talking about it. 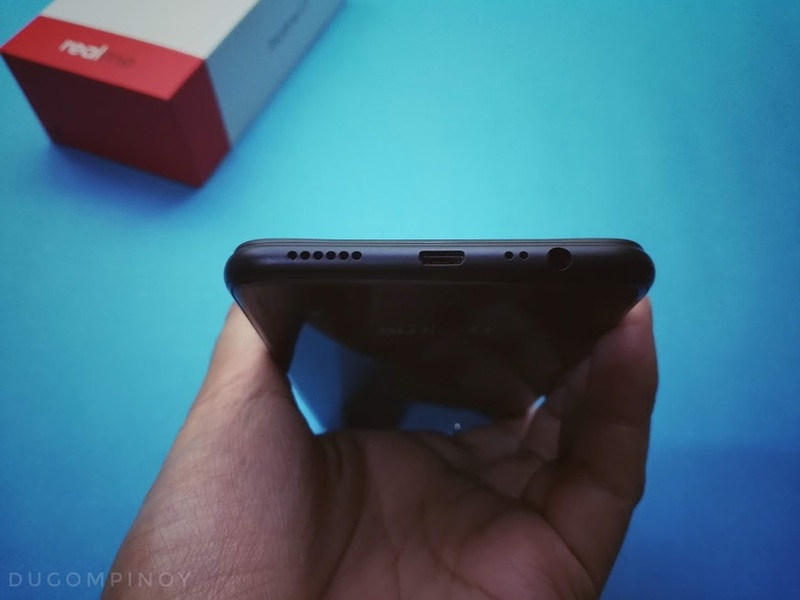 In fact, when the C1 phone was initially offered through Lazada late last year for an even more affordable price, Php5,490, it went sold out just on day 1. 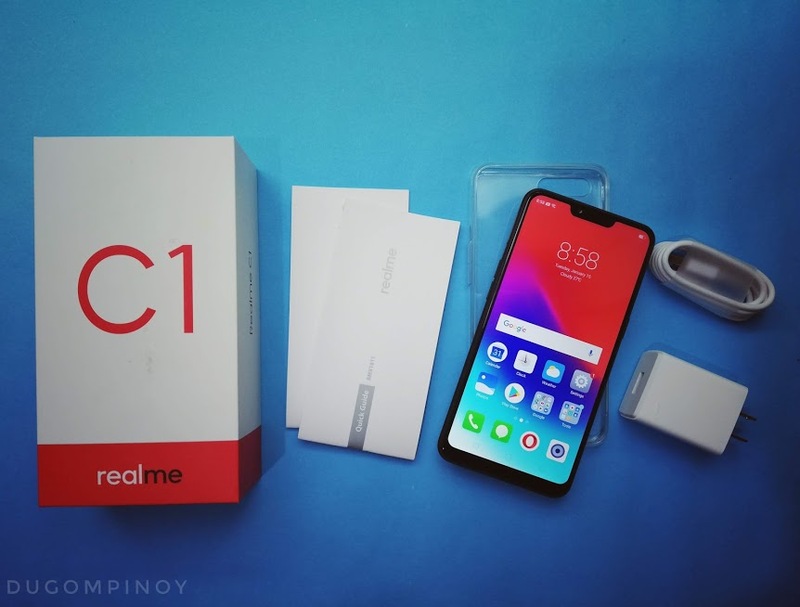 But of course Realme Philippines made sure to bring more C1 units in the country. So as of writing, apart from Lazada, this device is now also available in more than 1,000 partner stores nationwide for that same less than Php6,000 asking price. 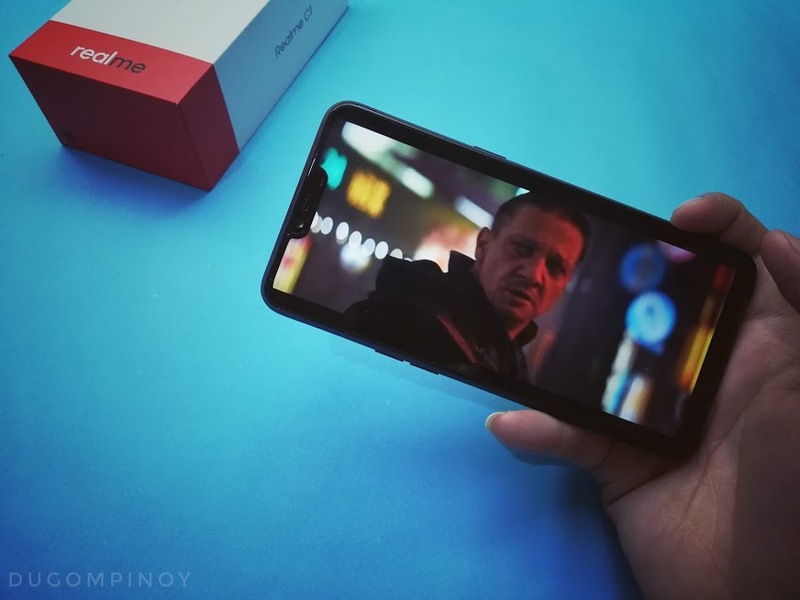 Now if you have been planning on buying this device but still wanted to see more unboxing and review articles about it, well thankfully Realme Philippines sent me one of this devices and here on the blog I will be sharing all my honest thoughts about this Realme C1 aka the #RealEntryLevelKing smartphone. So for now, I will be sharing my quick unboxing and initial impressions post of this device while I work on the full review which I plan to post in the coming days. If you would like to know my review of this phone, please don't hesitate to return. 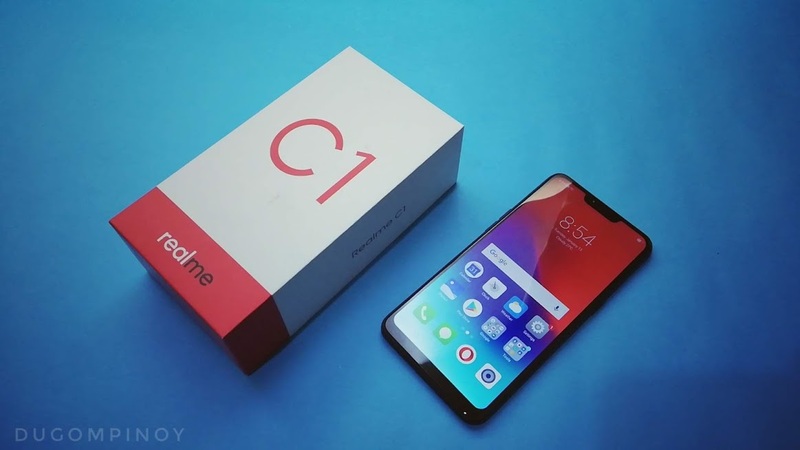 The packaging of Realme C1 includes the usual things we can expect from a smartphone box. There is the user guide paperwork, a free jelly case for phone's immediate scratch protection right out of the box, charging cable together with the OPPO-branded wall charger all in white, except for one thing. As you can see, there is no pair of earphones. The phone has a 3.5mm audiojack port though, which means you pretty much use any third-party earphones or headphones available around. Upfront, the C1 sports a big 6.2-inch display with 1520 x 720 screen resolution and a tall 19:9 display aspect ratio that is protected by a Corning Gorilla Glass. Realme claims it boasts 88.8% screen-to-body ratio. While the display is only at HD+, the display still looks pretty clear and bright and the color reproduction is accurate and vibrant. I will observe it more in the next few days, but my immediate impressions of the display is that it is really good, sulit right off the bat. There is the very noticeable notch up the screen, which is you know, a trend in 2018 for smartphones here and abroad. It houses the 5MP selfie camera together with the earpiece speaker and proximity sensor. If the notch is something you can live with, like myself, well here it is. As of the moment, there is no way we can completely hide this notch through the software settings like in other smartphone brands. Hopefully we get one through a software update in the future. But if you are going to ask me, I am actually completely fine with a notch, it does not really bother me at all. It even adds character to the device. Underneath is where we can find the microUSB port for file transfer via USB OTG or computer and charging, 3.5mm audiojack, microphone and speaker which by the way is really loud and can produce really good audio quality. The wake/lock or power button is on the right side of the device. On the other side are the volume rocker and SIM tray that has three slots, two for SIM cards and a third one dedicated for microSD card that can hold up to 256GB. Triple-slot SIM tray on smartphones is something that is not easily found anymore these days, so it's nice to know that Realme is generous enough to have this on C1 so we don't have to sacrifice the SIM 2 slot for a microSD card which we are definitely going to need on this smartphone knowing it only has 16GB onboard storage. Both SIM 1 and 2 support up to LTE connectivity though. So that's a plus. At the top side, well there is nothing to be found there. Build wise, the Realme C1 is well built and designed. I feels a bit hefty in the hand due to its huge 4230mAh battery pack that promises you to last for days on a single charge, but at the same time it is solid piece of device. 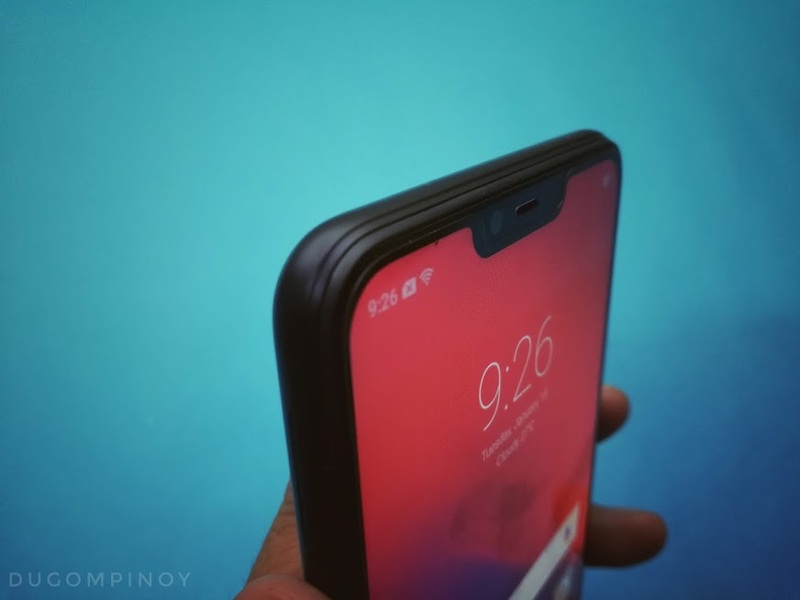 The rounded corners and chassis of the phone, though I am just not sure if it's made of metal or just super concrete type of plastic material, they just feel firm and solid to the hand. And then the back panel that holds the dual rear camera at the top left corner and the Realme branding at the bottom, it is not that clear in the image above, but it's a very shiny and glossy surface. From afar, it is easily mistaken for a glass material though it is not. Also it maybe fingerprint and smudge hungry, but that kind of aesthetics makes the device look more premium and sleek. In case you have not noticed by now yet, the fingerprint sensor is nowhere to be found here on the Realme C1. So how do we keep this phone's content away from intruders? Facial unlock and 6-digit passcode. The facial recognition feature to unlock the phone works almost all the time especially in good lighting condition but when it's a little darker, it sometimes having a hard time. In terms of speed, not really fast but acceptable enough for its reliability and for the phone's retail price. As for its cameras. It is equipped with dual-lens on the back pegged at 13MP+2MP with AI technology, f2.2 and f2.4 apertures respectively, as well as HDR and bokeh mode. On the front is a 5MP selfie shooter with f2.2 aperture and AI Beautification feature. Both rear and front cameras can record up to 1080p videos. 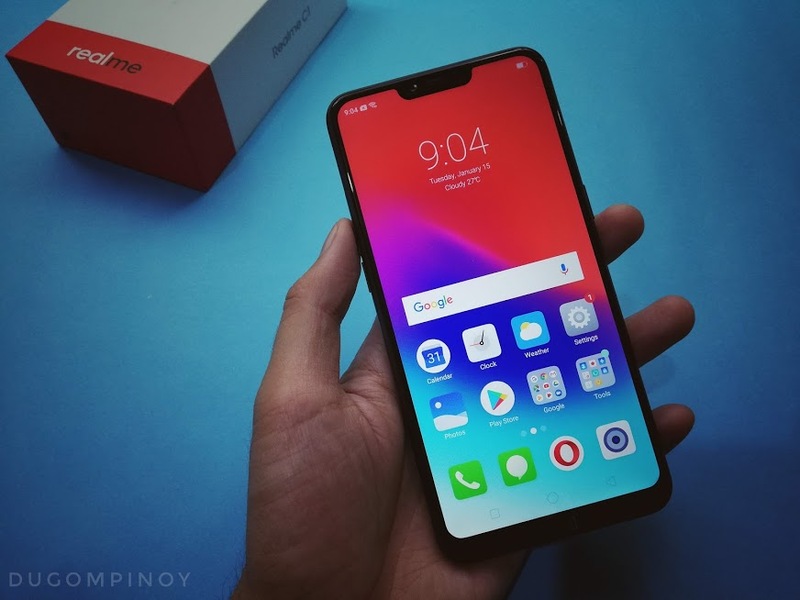 For only Php5,990, I can say that the Realme C1 is a solid steal. Among entry-level smartphones in the local market, this is the most premium entry level device I have ever had my hands on. Its design, specs, and software layout altogether are just some of the best deals you can get for that price range. Those are my first thoughts on the Realme C1. I will do more tests and observations on this phone as I use this as my daily driver in the next few days and weeks. Watch out for my future articles about this device especially my full review on this site. Right now, this smartphone is still available on Lazada and can also be purchased from more than 1,000 retail partners nationwide. If you are from Davao, you can buy yours from any Wiltelcom branches. It comes in Navy Blue and Mirror Black.